Drain Problems? We Have Drain Solutions! When the drains stop working in your Webster, NY home, it can be frustrating and even maddening. After all, without functioning drains, you can’t do much around your house. However, instead of sitting around worrying and being frustrated, give us a call. At G.T. Campbell, cleaning clogged drains is one of our specialties. 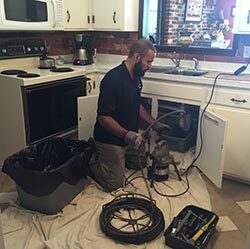 Our plumbers are trained and experienced in all sorts of drain cleaning, whether your problem is with one specific drain, the drains in one bathroom, or drains throughout your house. We know how to diagnose the problem and get it fixed quickly, efficiently, and as inexpensively as possible. How Big is My Drain Problem? One of the first things our plumbers look at when it comes to drain cleaning is how widespread the drain problem is in your home. This helps them know whether they need to clean one drain, the pipes from an entire room, or the sewer line. Pinpointing where the problem is helps them get their job done faster. If you only have a single drain that is clogged, the fix is usually straightforward: clean that drain. If your sink won’t drain, the problem is probably located in the pipes between the sink and the larger pipe that drains the entire bathroom. These fixes usually involve the use of chemical solvents or a plumbing snake. If all of the drains in one room, like your bathroom or the kitchen, aren’t working, then the clog is probably located somewhere in the drain for that room as a whole. It can be helpful to your plumber in Webster NY if you check on this before they arrive. Simply turn on another tap in the room and see if that drain seems clogged, too. Depending on where we locate the clog, this can be a more significant repair. We may need to remove a section of your wall or floor to access the pipe that needs cleaning. Don’t worry, though! We’ll help you get everything back the way it’s supposed to be! Finally, if multiple drains across different rooms in your home are clogged, then the problem is quite possibly in your sewer drain. This is the drain for your entire home, and it runs between your house and the city sewer in the street. If this is the case, we will send a camera down your sewer line to determine where the clog is. Then, we’ll use trenchless sewer repair technology to fix the problem. We probably won’t even have to dig a hole in your yard to make this repair. G.T. Campbell plumbers are experts in getting your drains cleaned. When something is clogged in your Webster, NY home, we are the ones who can get everything back to normal fast. Our plumbers travel with many of the tools necessary to clean your drains, so they won’t even have to leave to get equipment. They’ll show up, figure out what needs to be done, and get the work done before you know it.